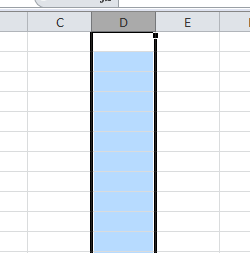 You want another user to use your created Excel file, and in a certain cell (or cells, or an entire column), you want that user to be able to enter only whole numbers, from 1 to 10. So if the user enters any other number apart from 1 to 10, or any decimal number, Excel should give an error and should not allow it. This is possible through a feature called Data Validation. 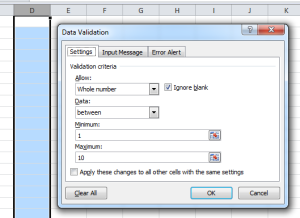 First, select the cell, cells or column where you want to apply this validation. Let’s say you want the entire D column to have this validation. Then, go to Data Tab, and click on Data Validation. In the Settings tab, under Allow, choose Whole Number. Now enter a number between 1 to 10 anywhere in D column, it will be accepted. Try entering any other number, an error will appear. This way, you can choose from a lot of option under the Allow drop-down.